Dell gave TechRadar an early preview of the next XPS 13 during a tour of its Round Rock, Texas headquarters. 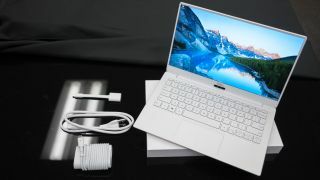 It’s clear the electronics firm’s latest 13-inch Ultrabook has taken design cues from the Dell XPS 13 2-in-1 as it is even thinner than ever. Gone are the full-size USB 3.0 ports in exchange for three USB-C ports. Sadly, this has also meant the SD card reader has been switched out for a Micro SD card slot. As ever the new Dell XPS 13 features an Infinity Edge display with nearly non-existent screen bezels. This design still displaces the web camera to the bottom the bezel, but rather than being located on the bottom left corner, it's now in the center. This should help user appear more towards the center of the frame during web calls, though, this still doesn't fix the unflattering chin-facing angle. Given there are two camera lenses, we surmise this Ultrabook may come with a Windows Hello capable camera similar to the hybrid version of this machine. Dell also introduced the updated Dell XPS 13 with a new Alpine White and Rose Gold color. The palm rest features a new woven glass fiber material that feels both soft and yet firm at the same time. Similar to carbon fiber, this new material involves weaving a crystalline medium and finishing the surface with a clear resin. Dell explained it had to develop the new material because it couldn’t produce an authentically white colored version of carbon fiber and it was unsatisfied with just giving it a coat of paint. Otherwise, Dell is keeping its lips sealed on more details about the new Dell XPS 13, but you can expect to hear much more about it at CES 2018 come next January.